What are the different types of solar inverters and how do they work? What are the different types of solar inverters? Inverters are an important part of any solar installation; they are the brains of the system. Although the inverter’s main job is to convert DC power produced by the solar array into usable AC power, its role is only expanding. Inverters enable monitoring so installers and owners can see how a system is performing. Inverters can also provide diagnostic information to help O&M crews identify and fix system issues. These important components are increasingly taking on decision-making and control functions to help improve grid stability and efficiency. With the growth of solar+storage, inverters are also taking on responsibility for battery management. Here is a look at some different types of solar inverters. Solar panels are installed in rows, each on a “string.” For example if you have 25 panels you may have 5 rows of 5 panels. Multiple strings are connected to one string inverter. Each string carries the DC power the solar panels produce to the string inverter where it’s converted into usable AC power consumed as electricity. Depending on the size of the installation, you may have several string inverters each receiving DC power from a few strings. String inverters have been around for a long time and are good for installations without shading issues and in which panels are positioned on a single plane so do not face different directions. If an installation uses string inverters and even one panel is shaded for a portion of the day reducing its performance, the output of every panel on the string is reduced to the struggling panels’ level. Though string inverters aren’t able to deal with shading issues, the technology is trusted and proven and they are less expensive than systems with microinverters. String inverters are commonly used in residential and commercial applications. Also, as technology improves allowing string inverters to have greater power density in smaller sizes, string inverters are becoming a popular alternative over central inverters in small utility installations smaller than 1 MW. String inverters can also be paired with power optimizers, an option that is gaining popularity. Power optimizers are module-level power electronics meaning they are installed at the module level, so each solar panel has one. Some panel manufacturers integrate their products with power optimizers and sell them as one solution known as a Smart Module. This can make installation easier. Power optimizers are able to mitigate effects of shading that string inverters alone cannot. They condition the DC electricity before sending it to the inverter, which results in a higher overall efficiency than using a string inverter alone. Power optimizers offer similar benefits as microinverters, but tend to be less expensive and so can be a good option between using strictly string inverters or microinverters. Central inverters are similar to string inverters but they are much larger and can support more strings of panels. Instead of strings running directly to the inverter, as with string models, the strings are connected together in a common combiner box that runs the DC power to the central inverter where it is converted to AC power. Central inverters require fewer component connections, but require a pad and combiner box. They are best suited for large installations with consistent production across the array. Microinverters are also becoming a popular choice for residential and commercial installations. Like power optimizers, microinverters are module-level electronics so one is installed on each panel. However, unlike power optimizers which do no conversion, microinverters convert DC power to AC right at the panel and so don’t require a string inverter. Also, because of the panel-level conversion, if one or more panels are shaded or are performing on a lower level than the others, the performance of the remaining panels won’t be jeopardized. Microinverters also monitor the performance of each individual panel, while string inverters show the performance of each string. This makes microinverters good for installations with shading issues or with panels on multiple planes facing various directions. Systems with microinverters can be more efficient, but these often cost more than string inverters. Microinverters can also be sold through panel manufacturers already integrated into the panel, similar to Smart Modules but instead known as an AC Module. This makes installation easier and cheaper. With the growth of solar+storage, battery-based inverter/chargers are becoming increasingly important. Battery based inverter/chargers are bi-directional in nature, including both a battery charger and an inverter. They require a battery to operate. Battery-based inverter/chargers may be grid-interactive, standalone grid-tied or off-grid, depending on their UL rating and design. The primary benefit of inverter/chargers is that they provide for continuous operation of critical loads irrespective of the presence or condition of the grid. UL1741 requires the grid-tied generation source to stop generating power in the event of a grid outage. This de-powering is known as anti-islanding, as opposed to ‘islanding’ which is defined as generating power to power a location in the event of a grid outage. Therefore, UL1741 grid-tie inverters will not generate power in the event of a grid outage, so a user will experience an outage irrespective of the availability solar harvest. Battery-based inverter/chargers will power the critical loads in the event of a grid outage, but will do so in a manner to not create the islanding condition. Further, UL1741 inverter/chargers may be rated as either interactive or standalone. The former export excess power to the grid, while the latter do not–by rating and by definition. In all instances, the battery based inverter/charger manages energy between the array and the grid while keeping the batteries charged. They monitor battery status and regulate how the batteries are charged. I am in UK. Have been told that my 6-year-old invertor’s fan is using unnecessary power. It is always humming but my loft is cool and the invertor is cold to the touch. I was told I would benefit a lot by replacing the unit and that it would cost £2,500 (about $3,000) No reason for the humming, and no way to fix it. What can you suggest? I have had solar panels for a little over10 years. During my most recent tru-up I received a bill in excess of $400. The message on the inverter was “test”. Someone from the company which installed the panels checked my system and advised me the the inverter needed to be replaced. Even though the inverter stopped functioning before the warranty expired, since the company was not advised until after the expiration, they are advising me that I am totally financially responsible for the replacement at close to $2000. So I now have solar panels which have not been functioning since February according to PG&E. I am unable to pay $2000, for a replacement inverter. Are there any programs to help with financing? Are there any good quality low-cost inverters which can be installed my a non professional? Thanking you for any assistance you might be able to provide. Please let me know how much is? I was thinking too for a long time that :”If an installation uses string inverters and even one panel is shaded for a portion of the day reducing its performance, the output of every panel on the string is reduced to the struggling panels’ level. ” But it is simply not true. If you completely block out one panel the voltage across that one wil be redused from about 30V to -2V. BUT the bypass diodes will let all the current be bypassed. So all other PV-panels work as normal. Am new to solar power generation. Currently have a system in Honduras that does not have storage capacity (no batteries). Issues with the electric company has caused me to want to install batteries to store any excess solar power. Do I need a special inverter to store the power in batteries? From your experience, if someone has a solar + storage option, do they typically have two interverters? ie. one for the PV system and one for the the battery/grid? Thank for affording me this opportunity, Nigeria is presently facing a power crisis and the government is not in any position to help . Am my local government providing my own borehole water, security, and now to turn to solar.5kva will do. how can you help. I will like to install an array of solar panels 300 watts each and 36 dc volts output. I will like to install them in series getting a total output of 360 dc volts, then I want to use an inverter, that will transform these 360 dc volts to 220 volts and probably a 5kw inverter without charging batteries capacity. Can you quote me one as soon as possible, because my son is in Miami right now so that he could bring it to me as soon as possible. 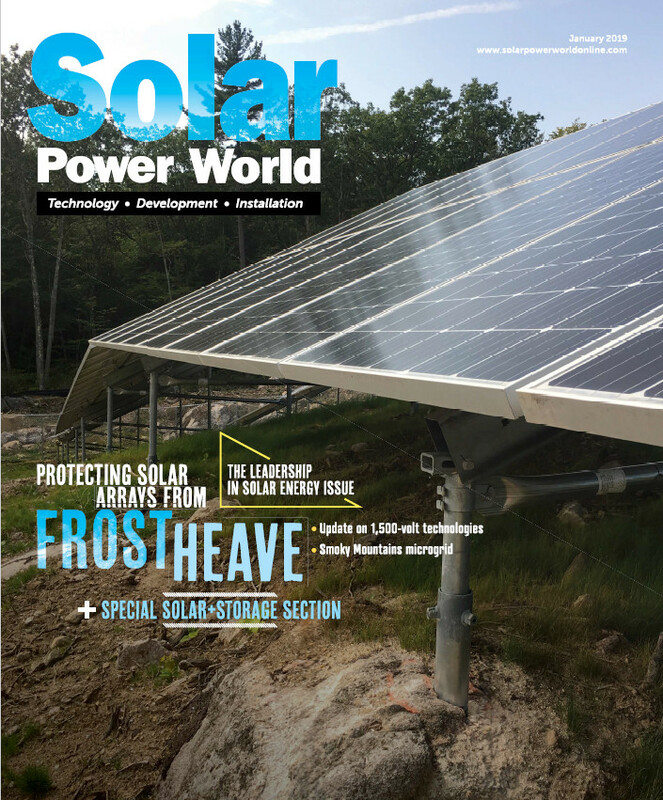 Walter — Solar Power World is a magazine, not a product supplier.